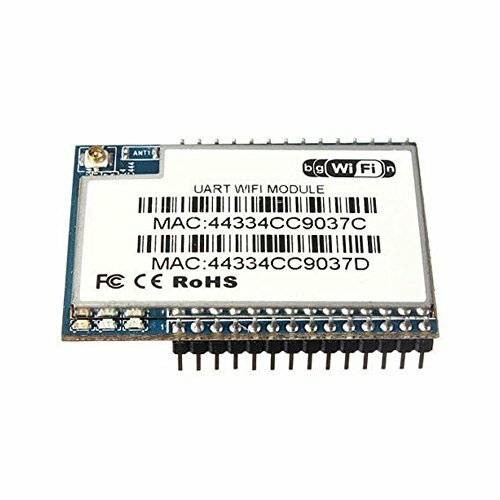 Solu HLK-RM04 wifi Module Serial to Ethernet wifi AP wireless routing module//Serial Uart to Ethernet Switch WIFI Module HLK-RM04 for Arduino Wireless//Serial Uart to Ethernet Switch WIFI Module HLK-RM04 for Arduino Wireless by Solu at AABX. MPN: SL290. Hurry! Limited time offer. Offer valid only while supplies last. This product ,embedded module, is based on the universal serial interface which accord with network standard, built-in TCP/IP protocol stack, can realize the user a serial port, Ethernet and wireless network (WIFI) any transparent conversion between the three interfaces. Through the HLK - RM04 module, traditional serial port devices in don't need to change any configuration, can through the Internet network transmit their own data. Usually, you will get it actually in 9~19 days, If you are in the USA and the item is NOT Fulfilled by Amazon. the item will be sent to you by USPS with shipping information from China. The estimated delivery time offered by Amazon is not the real time. Your patience is highly appreciated. Hope you will receive your item soon and enjoy using it. Built-in 360M MIPS CPU, 16M RAM and 4M FLASH, wireless baseband and RF front-end and a variety of peripheral bus.A serial port equipment for users to transmit data through Ethernet provides quick resolution. If you have any questions about this product by Solu, contact us by completing and submitting the form below. If you are looking for a specif part number, please include it with your message. © 2019 - aabx.net. All Rights Reserved.